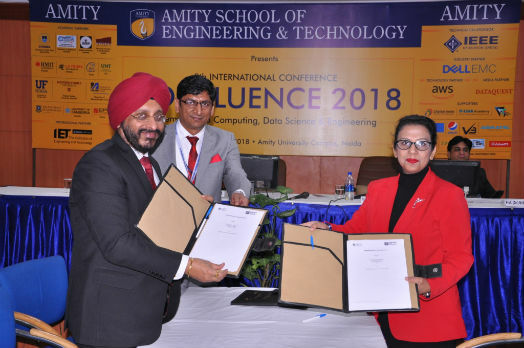 Noida: Department of Computer Science & Engineering, Amity School of Engineering and Technology (ASET) in association with DELL EMC Corporation organized “Confluence 2018”- 8th International Conference on the theme “Cloud Computing, Data Science & Engineering” which concluded today at Amity University Sector 125 Noida. The objective of the two day conference was to provide a common platform to Research Scholars, Scientists, Industrialists and Academicians to deliberate upon emerging trends and challenges faced by the industry and also to foster research relations between the Universities and the Industry. Dr. Ashok K Chauhan, Founder President, Amity Group said that the conference represents synergy of brains toward the right development of IT industry. He advised the students to focus on research as it will lead to new innovations which will eventually benefit the society. Dr. Chauhan averred that collaborations between Universities and Industry are important as with shared resources and knowledge, great developments could be done. Welcoming the gathering, Dr. Abhay Bansal, Jt Head, ASET said that the International conference e- ‘Confluence’ is an initiative to promote innovation & research amongst IT professionals and to bridge industry academia gap. He briefed that the conference witnessed keynote talks from more than 60 eminent Academicians, Scientists and Researchers from across the globe. Dr. Bansal expressed that the conference had been an enriching experience for the participants who deliberated upon challenges and emerging trends for development of IT industry. Amity Leadership Awards for Business Excellence were conferred upon Delhi Metro Rail Corporation, Hero Cycles, TATA Consultancy Services, NTT Data, Lava International Ltd, Franchise India, Lemon Tree Hotels, Orient Electric, Greenply Industry Ltd, PumpKart, Aerotech Aviation India Pvt Ltd, MediaTek, dreams Production House and Bharat Electronics amongst others. Wg Cdr Jatinder Singh from Aerotech Aviation India Pvt Ltd expressed gratitude towards the honor conferred and said that many companies around the globe are using cloud computing for real time information and analysis of cost reduction but in India, the usage of this technology is limited. He called upon the budding engineers to expand their knowledge on cloud computing and join the aviation industry for the growth and satisfaction of the customer. During the ceremony, Prof. (Dr.) Sunil Vadera, Professor, University of Salford, UK; Prof. (Dr.) Maia Angelova, Professor, Melbourne Burwood Campus, Deakin University, Australia; Prof. (Dr.) Shang Hong Lai, Director, NTHU, Taiwan and Prof. (Dr.) Keshav Dahal, University of the West of Scotland, UK were conferred upon Honorary Professorship at Amity School of Science and Technology. As part of International collaboration during the conference, Amity University signed MoUs with EPF Graduate School of Engineering, France; Network N+i: Engineering Study in France; University of Salford, Manchester, UK and University of the West of Scotland, Scotland, UK to promote academic and research corporation and mutual understanding through exchange of academic information & development of syllabi, organizing India Immersion programme, facilitating students exchange programs, developing study abroad programmes, exploring articulations and joint programs, filing of joint patents and doctoral student training, development and supervision amongst others. Dr. B K Murthy, Scientist G, Senior Director, Cyber Security Division, Department of Electronics and Information Technology, Govt of India; Prof. (Dr.) Peter J Coloe, Vice President, RMIT University Australia; Prof. (Dr.) Don Passey, Professor, Lancaster University, UK and Prof. (Dr.) Sanguthevar Rajasekaran, University of Connecticut, USA were present during the valediction ceremony. During the two day conference, paper presentations were made by Academicians and Research Scholars on various topics such as “Real Time Stock Prediction using Neural Network”; “Risk Analysis on Electronic payment and Settlement system using Dimensionality Reduction Techniques”; “Cognitive Robotics in Artificial Intelligence”; Artificial Intelligence Techniques used in Medical Sciences” and “Integration of Cloud Computing and Big Data Technology for Smart Generation.” amongst others. Various technical symposia, keynote talks, panel discussions and workshop sessions were also conducted.